On one of my two days off in London on my recent trip there, I decided to visit Kensington Palace – current home of Prince William and Kate Middleton and their children, Prince Harry and Meghan Markle along with Prince and Princess Michael of Kent, the Duke and Duchess of Kent, The Duke and Duchess of Gloucester, Princess Eugenie and Jack Brooksbank and of course, former home of Princess Diana. 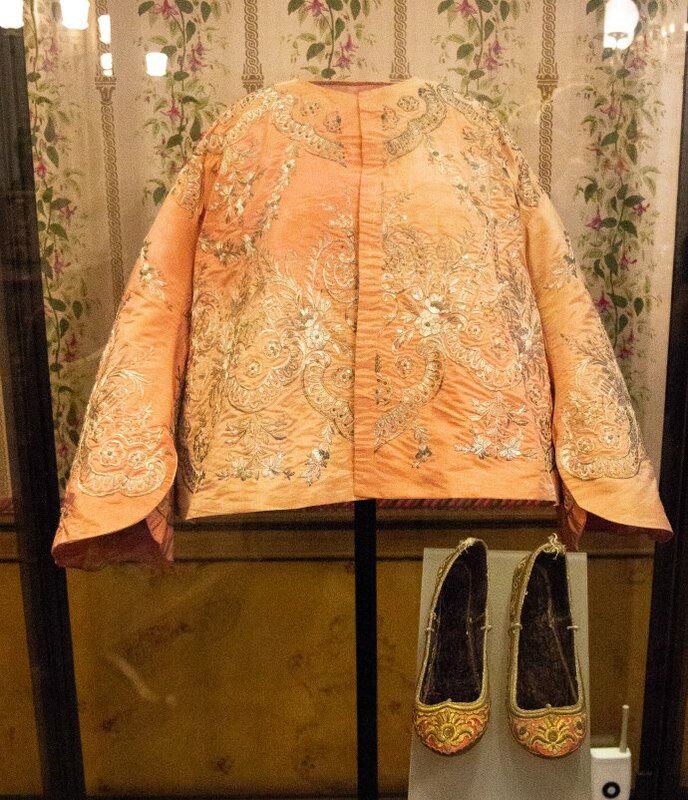 Currently, along with your tour through some of the palace – the King and Queen’s State Apartments and insight into the life of Queen Victoria as you spend time in the rooms where she spent her childhood and became Queen, there is an exhibition of Diana’s most memorable outfits. 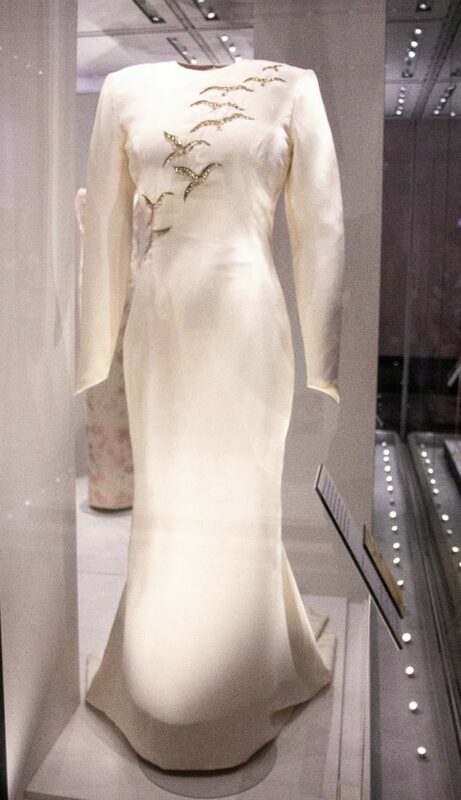 Tracing the evolution of Diana, Princess of Wales’ style – the exhibition is part of the ticket price of entry to Kensington Palace and runs until November 2018. 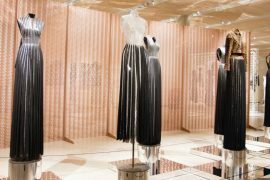 Diana’s patronage could catapult unknown designers to fame and her glamorous wardrobe raised the profile of British fashion worldwide. 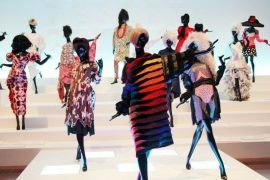 The Princess’s close relationships with key fashion designers also helped shape her own image. Each public engagement had its own clothing requirements, both practical and aesthetic. Starting in the early years of her marriage to Prince Charles, you can see her fashion journey and the evolution of her style from a shy, demure teenager to elegant and glamours woman. 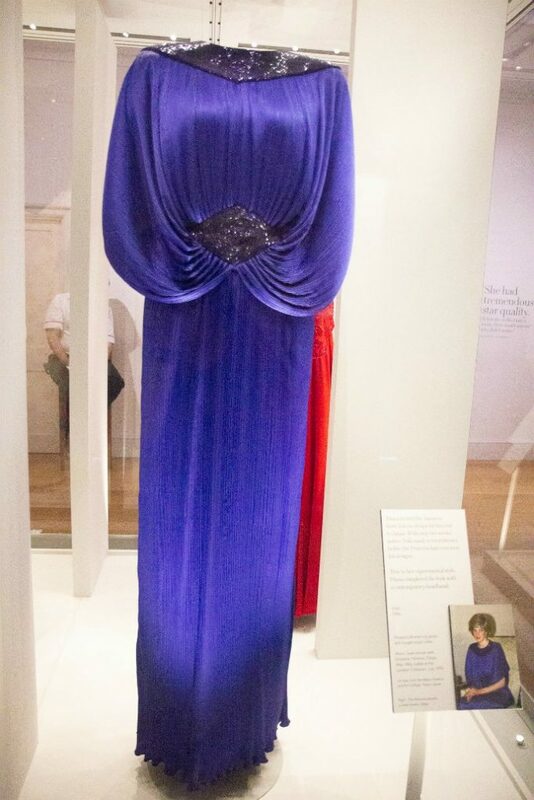 This dress was worn in their portrait by Terence Donovan (see below) in 1987. 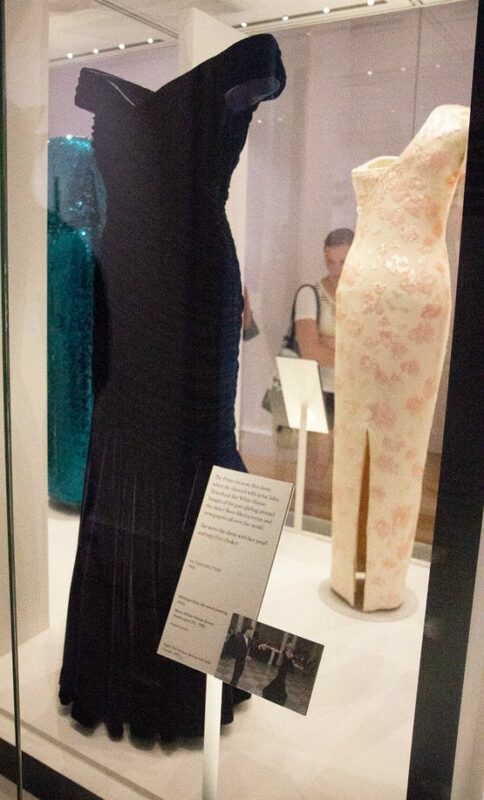 Princess Diana wore this sari-inspired dress to the ballet in Rio de Janierio in 1991. On the same trip to Brazil, Diana deliberately and conspicuously removed her glove before shaking hands with an AIDS patient. The gesture made international headlines and hlped dispel public fear of the disease. Gina Fratini for Hartnell 1991 – white silk chiffon gown trimmed with sequins and beads. Another iconic outfit was this one – simple chinos and chambray shirt – worn by Princess Diana on her visit to Angola in 1997. Decked out in body armour this outfit serves as a reminder of just how horrific a weapon landmines are and how they disproportionally affect civilians, long after armed conflict is over. Diana’s support for an international treaty banning landmines was seen at the time as a political stance, not merely a charitable one. Diana insisted her interest in the cause was a humanitarian one. The result is that now landmines are banned. 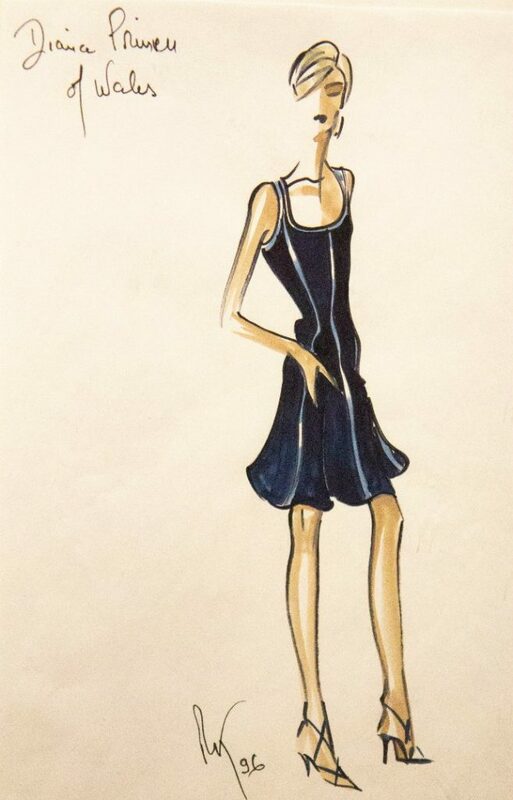 Included in this exhibition are fashion sketches of outfits designed for the Princess of Wales. 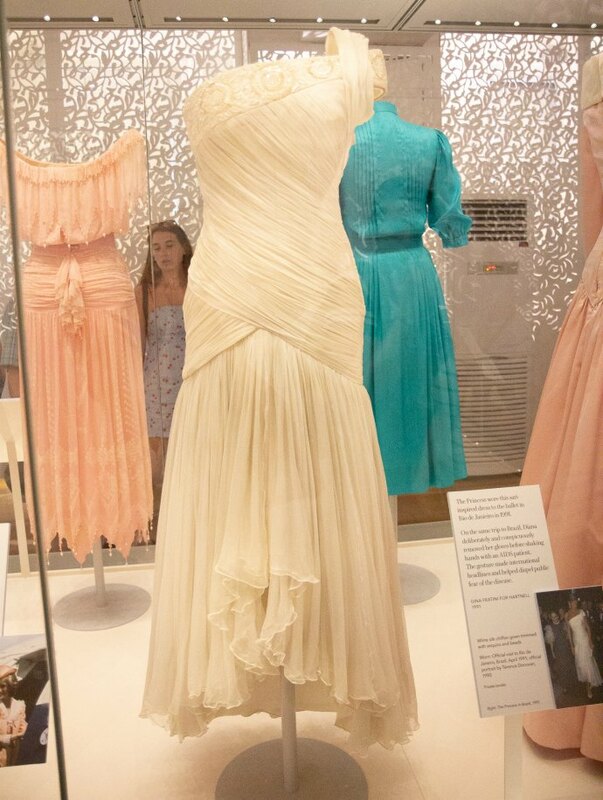 Included is a sketch of her wedding dress by designers David and Elizabeth Emanuel. The Princess carefully slected her look to honour host nations on offical visits. 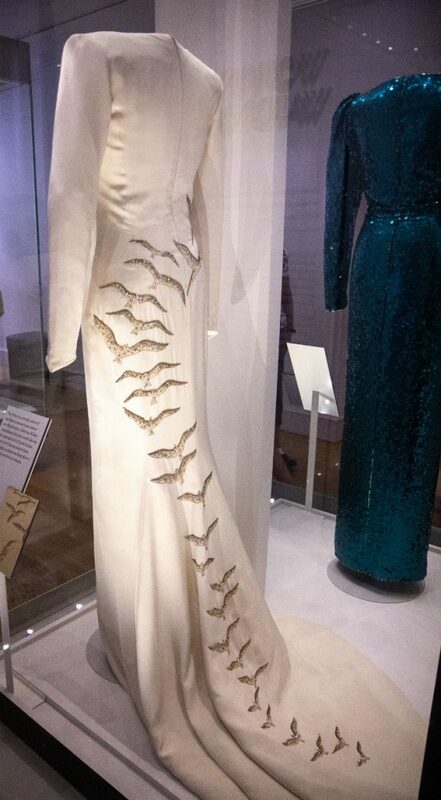 Catherine Walker embellished this dress with falcons, the national bird of Saudi arabia when the Princess visited there. The high neckline and long sleeves also respected local customs. 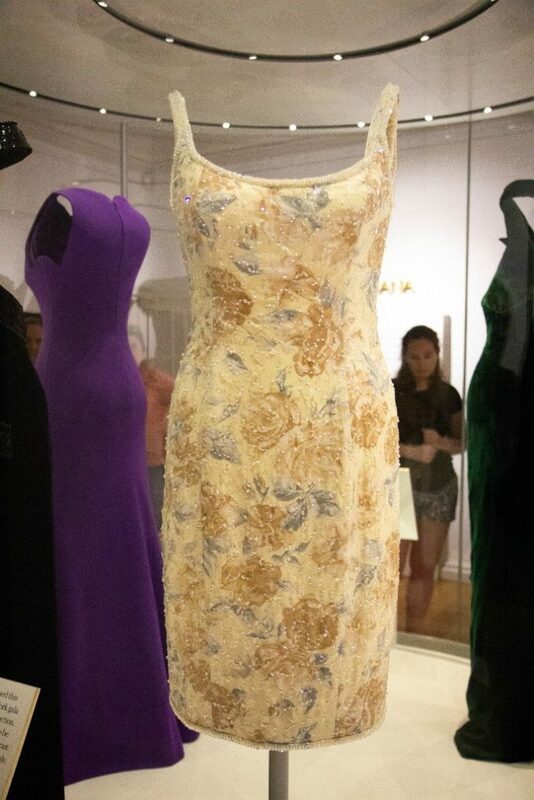 Catherine Walker became a firm favourite designer for Diana and was happy that Walker could concentrate on her. 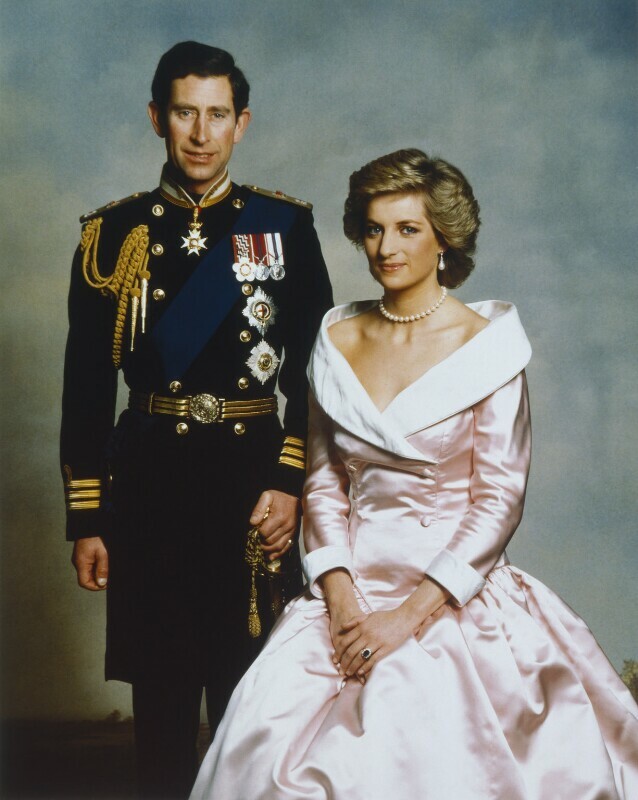 Their partnership helped hone Diana’s style and image over the year, developing what Walker called her “royal uniform”. 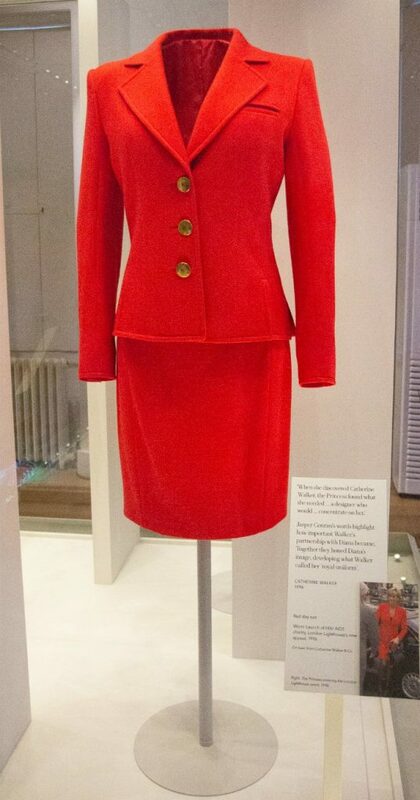 This suit is from 1996 and was worn at the launch of HIV/AIDS charity, London Lighthouse’s new appeal. 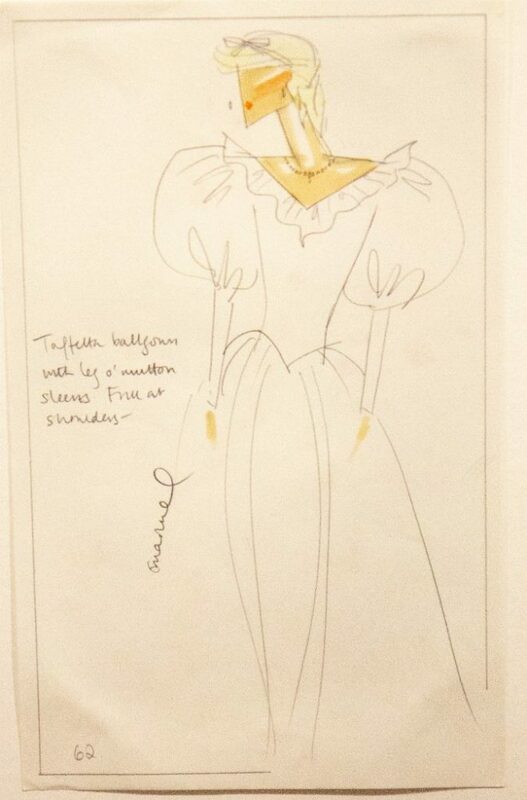 Another Catherine Walker design was chosen for the charity auction of her wardrobe in 1997. 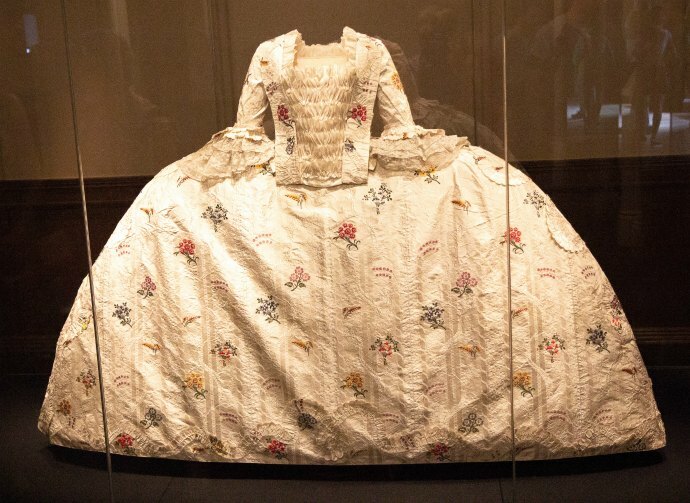 The Princess commissioned this dress to wear to the New York gala event before the Christies’s auction. 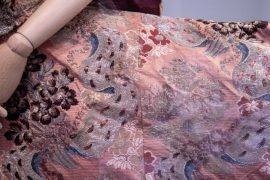 She wanted the embroidery to be light and understated, as a contrast to the more elaborate outfits on sale. 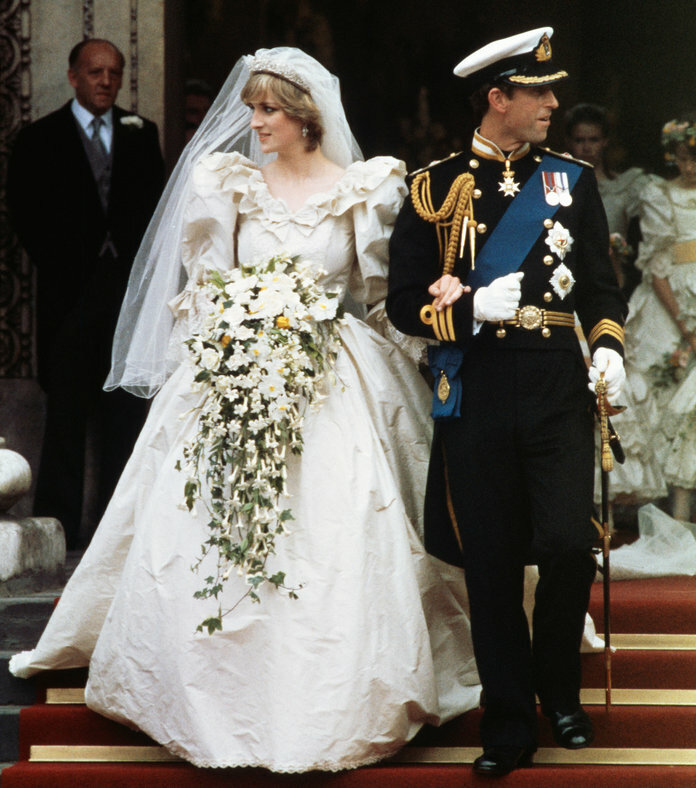 A champion for British designers whilst married to Prince Charles, Diana worked with designer Bruce Oldfield to achieve a glamorous and fashionable 1980s style that still worked for her royal duties. 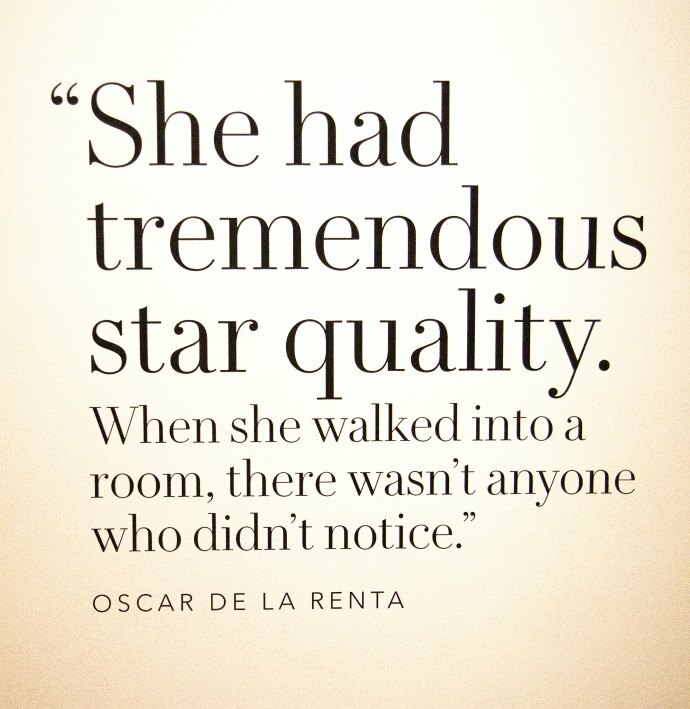 Beyond fashion, the pair shared humanitarian interests. Children’s charity Barnardo’s provided a home and education to Oldfield as a child. Diana was its President from 1984 to 1996. 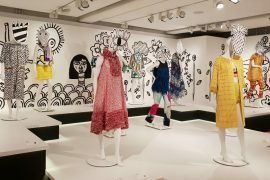 Diana invited the Japanese born Yuki to design for her visit to Japan. With only two weeks’ notice, Yuki made several dresses before the Princess had even seen his designs. True to her experimental style, Diana completed the look with a contemporary headband. 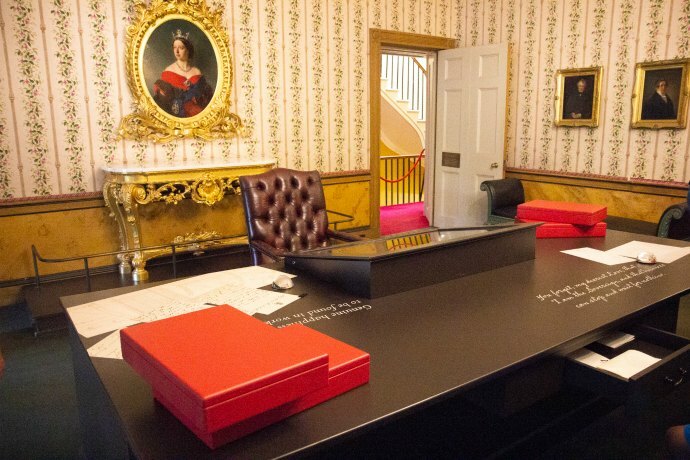 After her divorce from Prince Charles, her royal duties ended and she started to work with foreign designers. 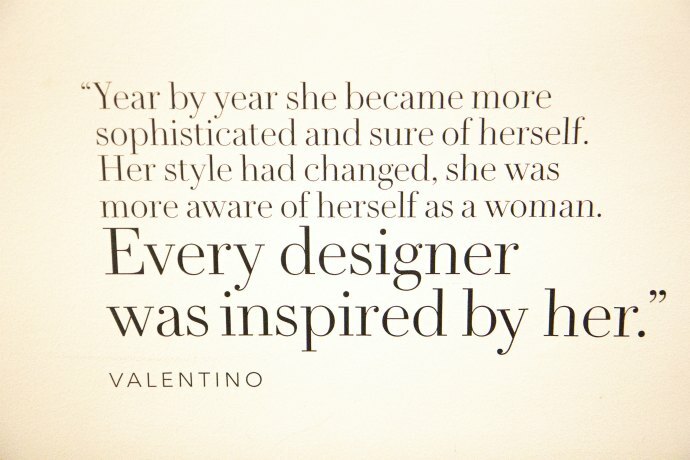 The Italian Gianni Versace was a favourite. This gorgeous dress was worn for a Harper’s Bazaar photo shoot with Patrick Demarchelier in 1991. 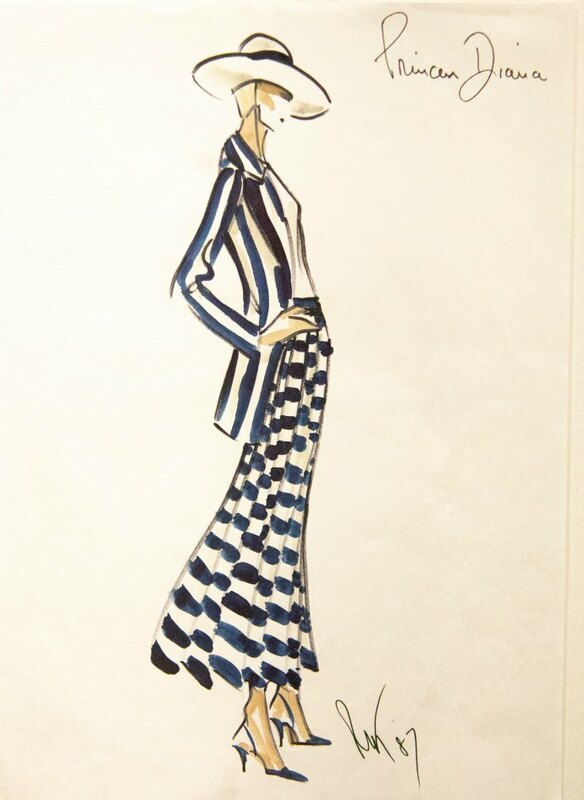 This striped suit was worn at Ascot (races). 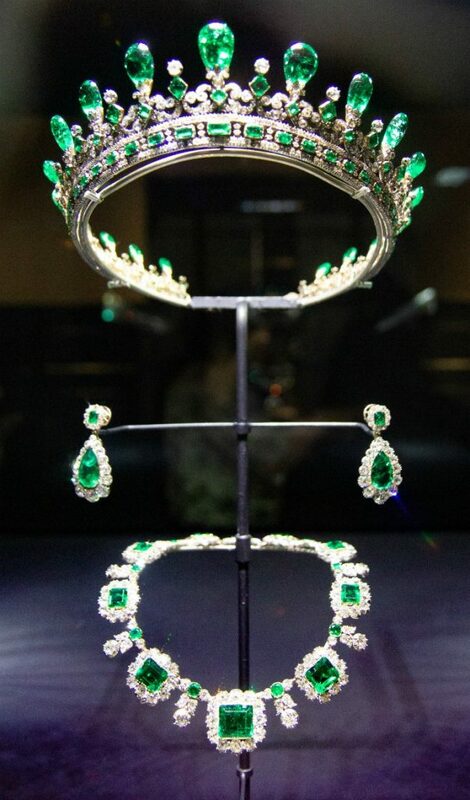 Inside Kensington Palace (the bits that are on show, not where the current royal family lives) you can see some of the older areas that are on public display, and just a few of the amazing jewels worn by the royal family. 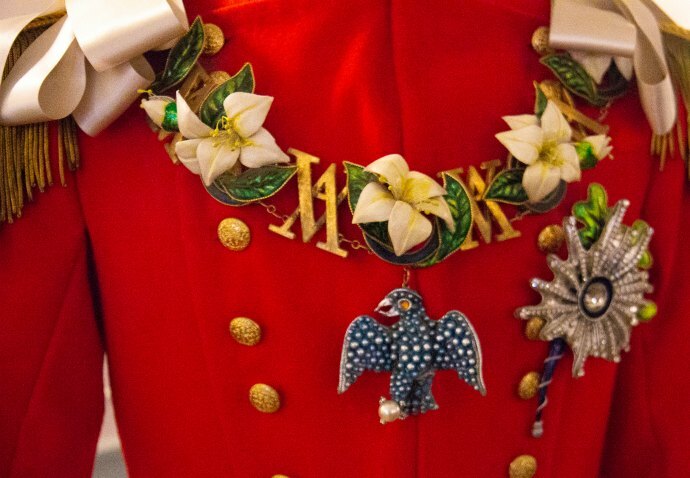 You get to explore the glittering court of George II and Queen Caroline and discover the era of music, fashion and the arts. 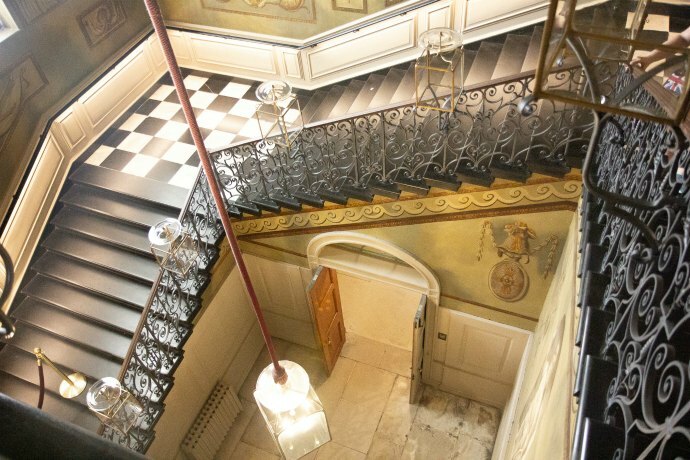 Step inside the oldest part of the palace. 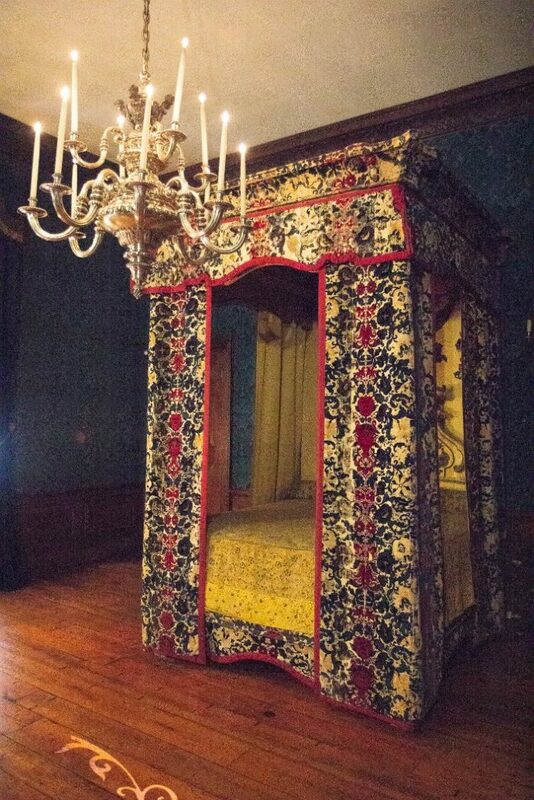 These intimate rooms were created for Queen Mary II who ruled with her husband King William III. 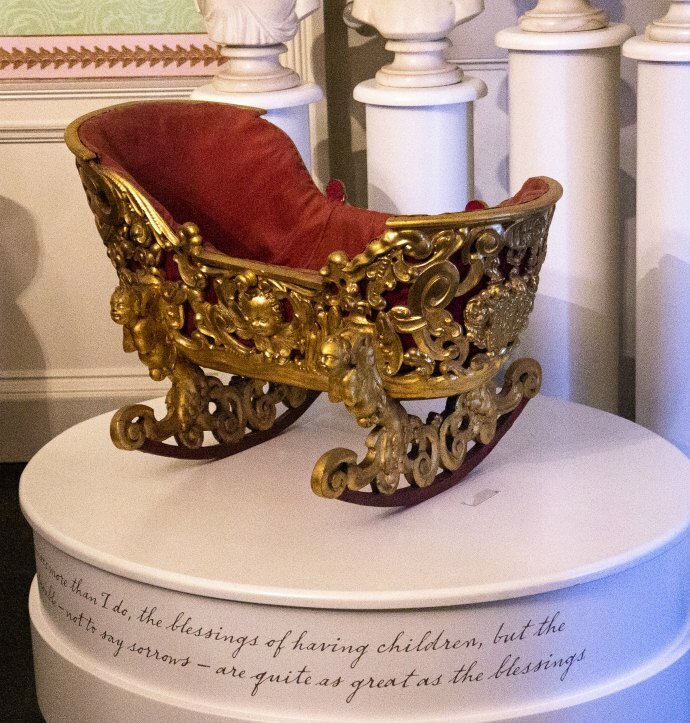 See where Queen Victoria spent her childhood and became Queen. 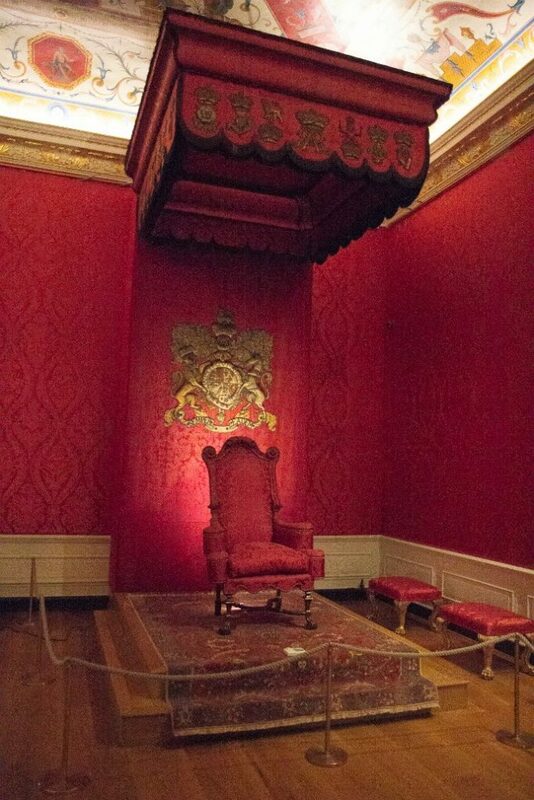 Having recently watched the TV show Victoria and Albert it was lovely to see up close some of the spaces that they actually did inhabit. 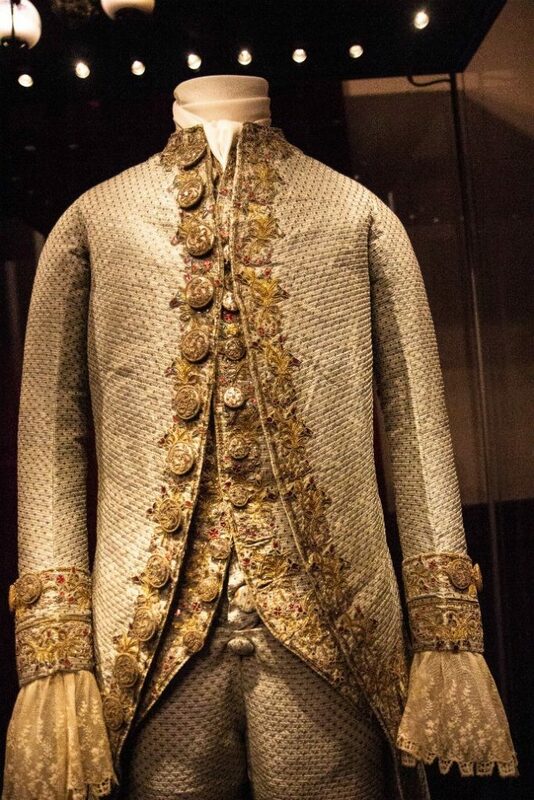 Seeing this outfit that belonged to Prince Albert, how decorated, and how tiny it was (I knew Queen Victoria was a tiny person, but Prince Albert was also very small). 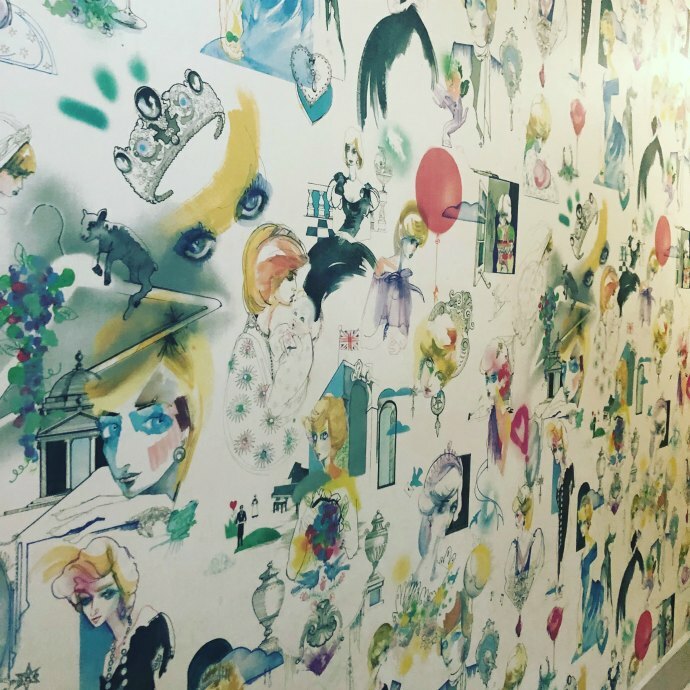 And before you leave the palace, don’t miss this fabulous Princess Diana wallpaper created from sketches by Julie Verhoeven based on famous photos and the wallpaper was created by the interiors firm Colefax and Fowler who are renowned for printing authentic period wallpapers. Welcome home, Imogen! Your fans have missed you! 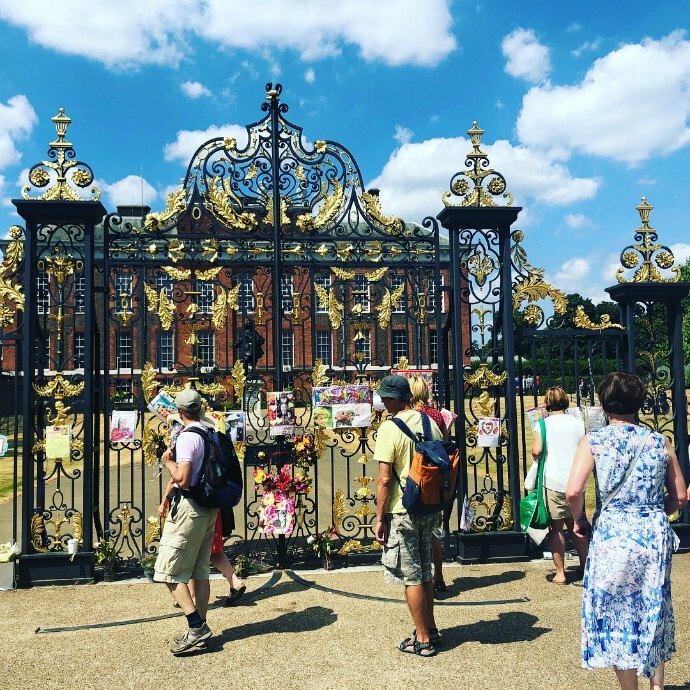 Looking at your fabulous photos of Diana and Kensington palace brings to mind a wonderful experience with two of my daughters about 10 years ago. We toured Paris and London and we wanted a memorable high tea experience, not at the hotels. 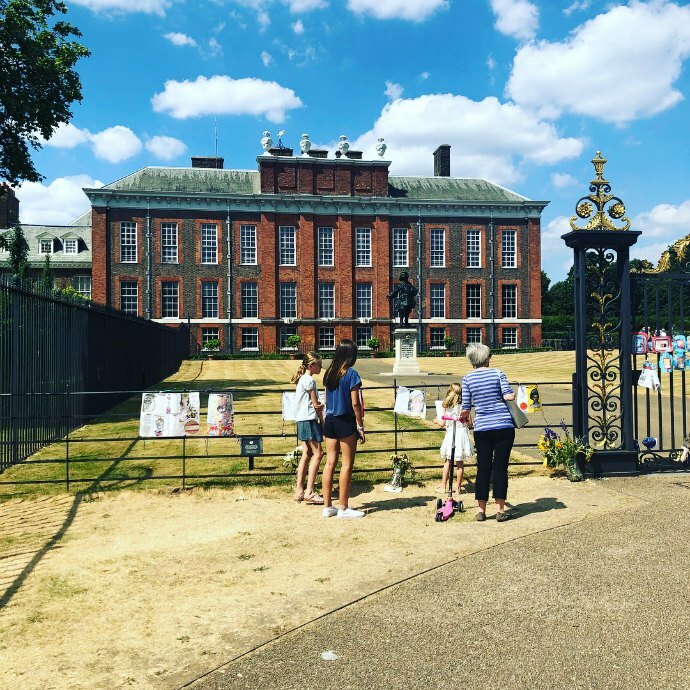 Our last day in London someone suggested tea at Kensington Palace. 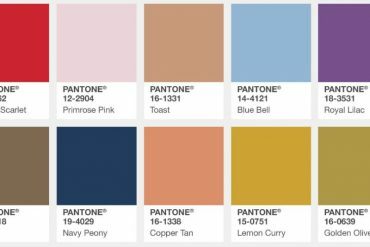 All fans of Diana’s, this appealed to us immediately. 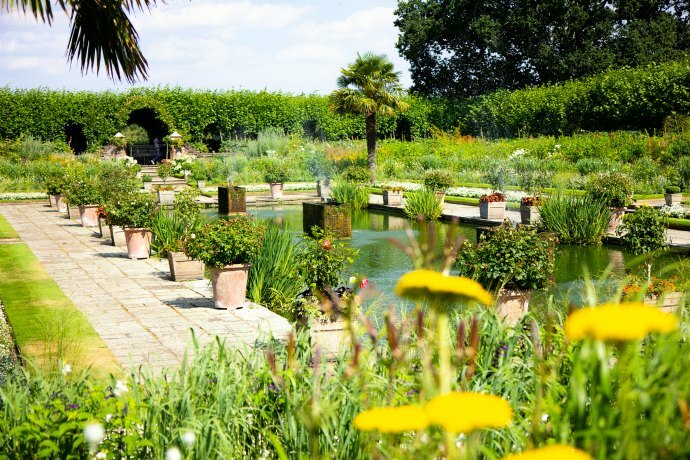 Surely, the hotels prepared a fabulous meal, but my daughters and I will never forget our tea at the palace in the garden orangery. Thanks so much for the warm reminder. Thanks Pat – What a lovely memory you have of your travels! Welcome back. 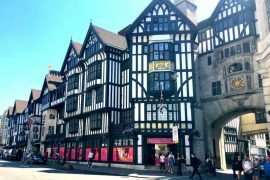 These are great pics – I would love to do this tour! I really enjoy the style evolution of the Royal ladies, but Diana was especially lovely (I remember staying up late to watch her wedding – I was 11. 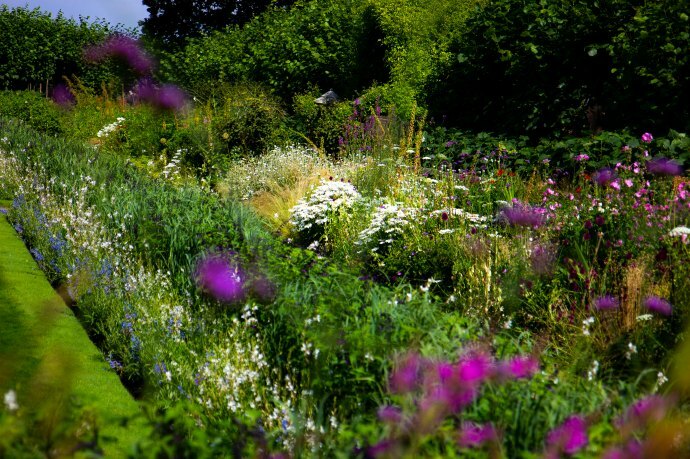 Gorgeous — thank you so much for sharing with us! 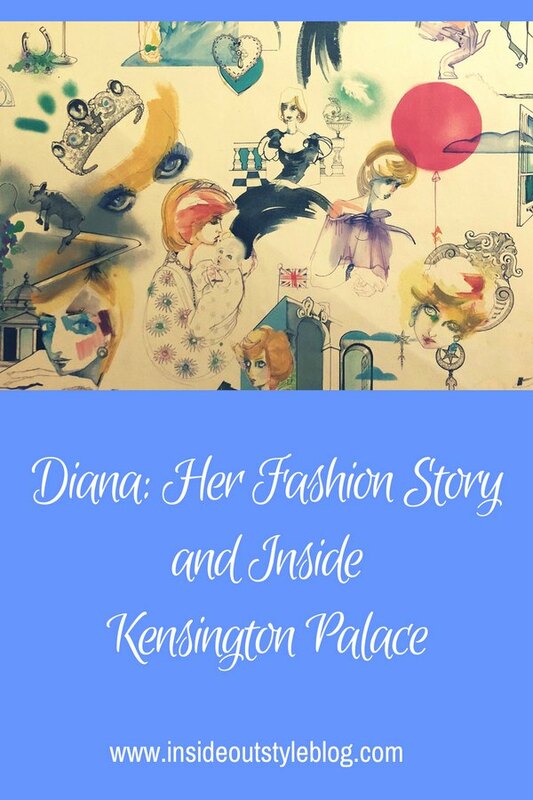 Such a lovely post, a great icon of style Diana! I thoroughly enjoyed this post! The pics were great and the commentary wonderfully written. Thank you for taking me on tour! Chary – thanks so much! It was lovely to take a tour! This was such a treat to read and see Imogen !